Cooking on Skates: Free shirt! Sorry, I'm not handing out a free shirt. For a moment I thought maybe I'd make this a giveaway post, but I'm not that nice. Maybe someday in the future, if I get the idea that there would be enough interest. For those of you who don't know me very well, I'm a clothes-a-holic. I love buying clothes, specifically jeans, t-shirts and dresses. Because I work an office job Monday through Friday, I have more t-shirts than I know what to do with. A couple times a year, I go through my closets and give old things away to friends. 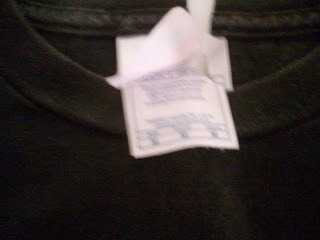 But there are always shirts that I can't bear to part with, even though they're too big/small/short/awkward. This was one of those shirts. 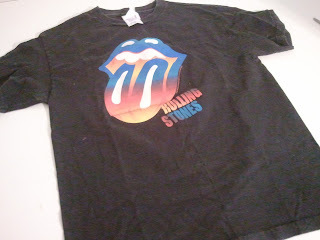 It was given to me as a gift by someone who knows that I love both the Rolling Stones and classic rock t-shirts. It had been sitting in closets, unworn, for three or four years. When I had a little free time, I started by cutting straight up the back. This particular shirt didn't get worn often because it's a men's medium, which is too big for my style. Being fairly new to clothing modification, I thought that this oversized shirt would be a good place to start. Then I cut the sleeves off to make a tank top. 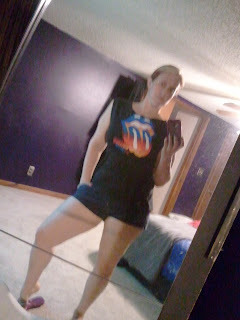 It's hot outside, and between derby practice and walking the dog I never have enough tank tops I like. 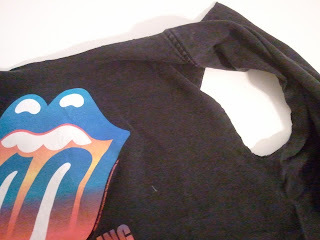 I started by cutting just outside the seam in hopes that this will keep it from fraying in the wash too badly. It works for me for now. I also made straps out of the back, cut as low as I could down the front, and cut pieces out of the back. But I didn't take pictures. That doesn't make this a very useful how-to, does it? In my defense, my hope here is to inspire you to pull out some rarely-worn shirts of your own and cut/sew/pin/tie them back to your liking. If it doesn't work out, you haven't lost anything. 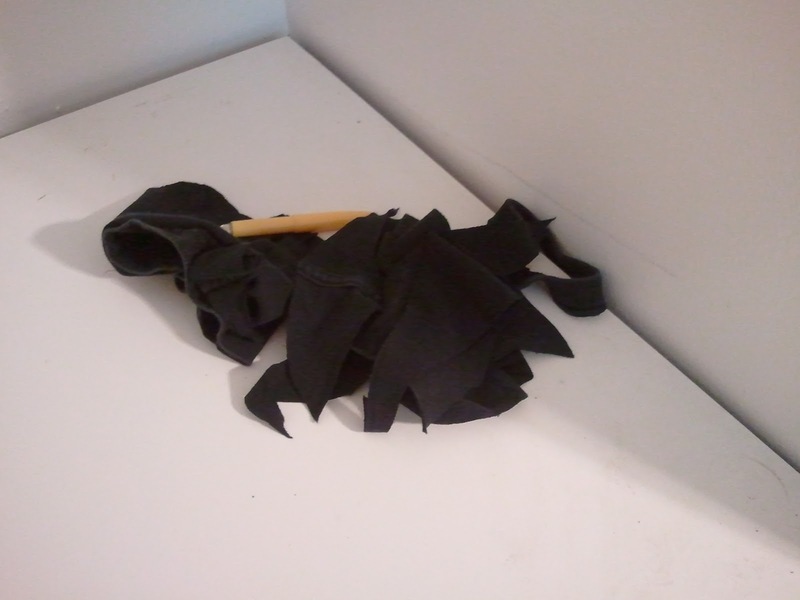 Here are the scraps from the project. Surprisingly little was thrown away. The front pretty much looks like a tank top. It's fairly long, scoop-necked with wide straps. The back is open and tied around front in a tiny bow. It gives the openings an asymmetrical look, and most importantly shows off both of my tattoos. It also pulls the shirt in under the bust for a more feminine fit. If I decide later that this isn't quite working for me, I'll cut more out of the back and just tie it there. I love the asymmetrical back and the barely there scoop neck. It ties around the front? Thanks, Ashley! 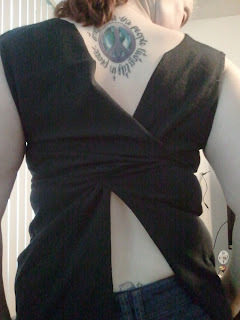 I did tie this one around the front, which made the asymmetrical back work. 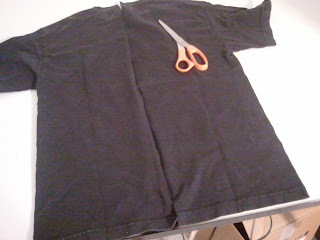 Tied in the back, it was a little too big (I could fix that by cutting more material) and had two even cutouts. Definitely try it first on a shirt you don't like! Love this! How did you do the bow in the front? Will you show me how to do this sometime? I need to give your glue gun back, BTW ... I successfully made the earring holder!